US military ties with Sri Lanka: Is the strategically located Indian Ocean island being cheaply had? As the US government engages in the complicated process of approving its budget for Financial Year 2018, we are told that the Trump administration had requested US$ 3.4 million in foreign assistance for Sri Lanka. Readers could be forgiven if they thought it was a typo in the news reports they read. But it was confirmed in Acting Assistant Secretary of State Alice Wells’s statement to the US House Subcommittee on Asia and the Pacific on September 7. US Senate and House Sub-committees have both opposed the 92% slash in funding, with the Senate Subcommittee on State and Foreign Operations Appropriations recently approving a revised sum of US$35 million under the ‘Economic Support Fund,’ according to reports. But this amount, modest as it is, comes with hefty conditions attached that would have implications for Sri Lanka’s sovereignty and independence, since it is conditional on laws being repealed or changed, demands as to how Sri Lanka’s military shall be deployed, decisions on the military’s restructuring and its size etc. It further links the assistance to “supporting a credible justice mechanism in compliance with UNHRC Resolution (A/HCR/30/ L.29) of October, 2015” (which incorporates all of the above and more). The latter condition was also central to Wells’s testimony before the Foreign Affairs Subcommittee when she said “We (meaning the governments of the US and Sri Lanka) “are working together to fulfill the steps to which our nations agreed in a resolution 30/1 at the UN Human Rights Council in 2015.” Wells links the assistance to constitutional reform, devolution of power, repeal of the Prevention of Terrorism Act and other specifics contained in Resolution 30/1 such as establishment of an Office of Missing Persons, Truth and Reconciliation Commission and prosecutions for alleged war crimes. Such is the tall order that (it would appear) is expected in order to receive the grand sum of US$3.4 million in assistance in 2018. Sri Lanka co-sponsored a 2015 HRC resolution led by the US and UK which, among other things called for an investigation of alleged war crimes with participation of foreign judges, investigators, prosecutors etc. President Maithripala Sirisena has since stated that foreign participation is unacceptable. For perspective on the figures, it’s useful to recall that when Prime Minister Ranil Wickremesinghe visited Beijing earlier this year, China pledged over US$ 300 million in development assistance to Sri Lanka for the years 2018 – 2020, apart from over US$ 60 million in the current year, according to reports. China’s gift in 2011 of the ‘Nelum Pokuna‘ (Lotus Pond) theatre/auditorium alone is valued at over US$ 19 million. While it is true that Sri Lanka has gotten into a debt trap over Chinese infrastructure projects based on loans, it is also true that China does not make its money conditional on internal political and system change within the country. It could be argued that if Sri Lanka failed to negotiate skillfully in securing the Chinese loans (which it had the right to do as a sovereign state) and its bureaucrats and politicians were involved in corrupt deals, it has only itself to blame for those lapses. This relates to Alice Wells’s reference to the US’s growing interest in establishing military ties with Sri Lanka, in her statement to the Congress Sub-committee where she said “The current coalition government’s commitment to a reform agenda has prompted growing interest in expanding engagement with the U.S., including in military-to-military relations.” While the terminology suggests US interest in military ties with Sri Lanka is some kind of payback for the government’s ‘commitment to a reform agenda,’ it is obvious that the eagerness to establish military ties only serves the US’s own strategic purposes. 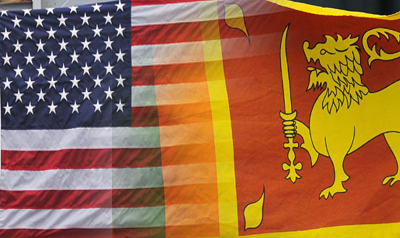 The US mainly seeks to deepen ties with the Sri Lanka Navy (SLN), as the frequent US warship visits and training exercises with the SLN show. The ‘first ever US-Sri Lanka Naval exercise’ is now set to take place in the Eastern town of Trincomalee, a long-coveted, strategically located natural deep water port, under the tutelage of the US Seventh Fleet. There has been a focus on amphibious operations in particular, and multiple missions to train Sri Lankan personnel in areas that would presumably be useful to the US in an anticipated conflict scenario in the Indian Ocean or beyond. Earlier this year the Americans set up and trained an elite Marines Battalion within the SLN, described as “a master of amphibious operations,” and “fully fledged in undertaking any form of threat coming from the seas…” Seeing that Sri Lanka has no enemies who are likely to invade the island, what is the explanation for this perceived ‘threat from the seas?’ It could only mean a ‘threat’ to Sri Lanka’s partner in these exercises – namely the US. So it is clear that by committing its personnel, vessels, equipment and skills to these training exercises the US is investing in its own security and not that of Sri Lanka. Considering the strategic gains for the US, Sri Lanka is being cheaply had. It’s worth pondering the profound and bitter irony that the US today exploits for its own strategic purposes, the very Sri Lankan armed forces whose leaders it seeks to crucify in its hypocritical crusade over human rights, using Resolution 30/1 as its weapon. Big powers plan strategy decades ahead (not just long enough to stay in power for five years, as in Sri Lanka!). Given that the stakes are high, it would be fair to surmise that this situation has come about not by accident but by design. The US in Sri Lanka: when does ‘Aid’ become espionage? Sri Lanka’s new Constitution – a neo-colonial project! The Greatest Indonesian Painter and “Praying to the Pig” Bigoted monks and attacks on Rohingya: Shades of Myanmar in Sri Lanka?